How bad is it? Listen to an interview with an expert. We have been lied to, right from the start. The danger continues, for ALL of us, as radiation continues to stream from the site and fall out over the United States. The possibility of future catastrophe still looms, with the continued risk of an explosion. This is not an extensive update, but I wanted to present a video, by a mainstream media source (CNN), for those of you who still believe no one but the major networks is credible. I don’t understand all the implications of this, even though it is a story I have been trying to share for some time now. We have been exposed to radiation (our initial exposure was most likely March 18-22nd), we are continuing to be exposed to radiation, and we are not being given the facts. I am not sure what any of us can do for ourselves, because we still don’t know exactly WHICH radioactive elements we have been exposed to, HOW MUCH of them we were exposed to, what we can do to detoxify ourselves (if it’s possible), or how we can minimize further exposure. More than anything, we need accurate information. I think that is the place to start. If you are a Christian–start praying that the story will ‘break’ for real, and that we will begin to get accurate information. This is just part of the judgment of God on America. Please hear me–when God judges a nation, He doesn’t hurl down thunderbolts from heaven. When a nation is blessed by God, it means His hand of protection covers it. When a nation is under judgment, it means God withdraws His hand of protection. America has lived under God’s protection for so long, that we have no idea what it is like to be at the mercy of nature, or at the mercy of our enemies. Because of living so long under God’s blessing, we became arrogant and started to believe we were blessed, successful, and prosperous because of our own goodness. Yet, at the same time, our society has become more depraved, more perverse, more wicked, more violent, and more arrogant than ever. Stop and repent of your sins. God cannot continue to bless and shelter a nation that has become so disobedient. If you will not repent, God’s judgment will come. It is a simple message, that so far has gone unheeded. Consequently, judgment has begun. The situation at Fukushima should wake us up to the fact that no matter how much food we store up, no matter how deep we dig our bunkers, things are going to come that we never expected or prepared for. America–why go to such great lengths to try to spare ourselves from the effects of judgment, if can simply repent and God will turn back the judgment instead? If you want to know the truth, you are going to have to look for it. The mainstream media seems to have been transformed into the propaganda arm of the US government. The reports I see show that things are far worse, in regards to Fukushima, than we are being told. I’ll give a brief overview, but there’s more than I can cover. Citizens in Japan have begun testing and compiling their own data. Children have been getting sick outside the ‘danger zone’. An earless rabbit was born near the damaged nuclear plant, and now three earless rabbits have been born in southwestern China–not in the direction the wind usually blows. Three reactors melted down in the early hours following the March earthquake and tsunami. An explosion occurred several days later, in reactor #3, that appears to have released a large amount of various radioactive particles into the atmosphere. Radioactive iodine was later detected at unsafe levels in rainwater in various U.S. locations and made it into tap water, at high levels, in some places. Philadelphia was one of those places, and they are now questioning a ten week spike in infant mortality there (the video appears to have been removed from the main Fox news site). Most recently, two days ago, there appears to have been another large release of radioactivity from the spent fuel pool at reactor #4. (skip ahead to about 1:45–it continues from there) Depending on the wind patterns, that release may already be reaching Alaska and/or the U.S. west coast. This isn’t going to be resolved for many months, or even years, from the look of it. A filtration system, that was supposed to remove radioactive cesium from contaminated water at the site, reached its capacity after just a few hours–rather than months, as had been expected. Levels of radiation at reactors one and two appear to be rising. There is widespread contamination of groundwater. Curium-244 has been detected (this element requires a lead shield 20 times thicker than what is needed to protect against radiation from plutonium-238). It is not by accident that the news was withheld. The more we learn, the harder it is to wrap our minds around the immensity of this disaster and its implications for all of us. The news will continue to leak out slowly. Because the decision was made for the EPA to pretty much stop monitoring, we really don’t know how much exposure any of us has had. My suggestion, if you live in Alaska (especially), or the west coast of the U.S., is to find some way to be tested for radiation exposure–and share the findings. As in Japan, the truth probably isn’t going to come out until concerned individuals take matters into their own hands, to do testing and to share the results. We don’t know which, of a number of radioactive elements, we may have been exposed to–nor do we know what effect it will have on our health. This summer, we will begin learning of different animals whose offspring are born abnormal. In the fall, most assuredly, Japanese babies will begin being born that are not normal or don’t survive. Unfortunately, some newborn babies in the U.S., and even around the world, are going to show the effects of their exposure, as they were developing in their mother’s womb. Now all this is bad enough, and I wish it was the end of the story . . . but, as things appear right now, there is potentially more bad news on the horizon–and closer to home. Right now we are experiencing tremendous flooding throughout the midwest. Several dams have been pushed to their limits and the water continues to rise. 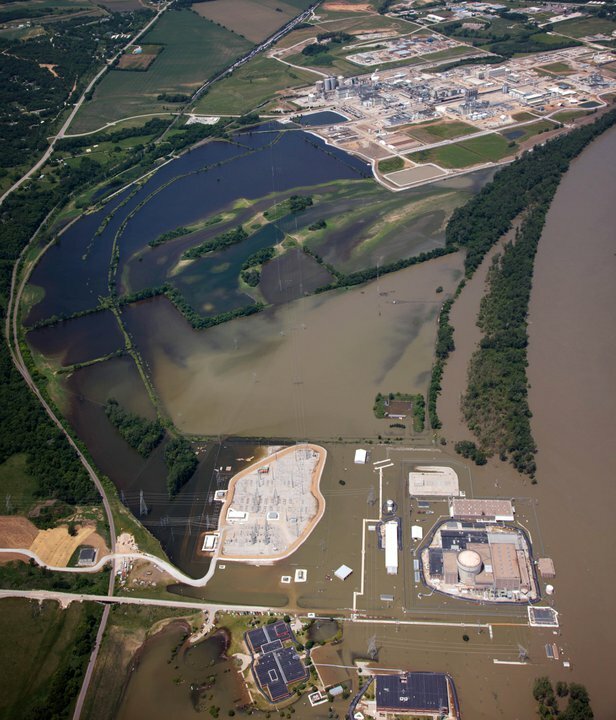 One of these places is near Omaha, near the Missouri River, where the Fort Calhoun nuclear power plant has been encircled by floodwaters. The impending disaster seems to be the eight feet of snow on the ground (upstream) in Montana, rains from the past few weeks that are still moving downstream from their source, and heavy rains forecast for the next few days. As I mentioned, most of the dam reservoirs are already at capacity. Both the Fukushima and the Fort Calhoun stories are playing out as I write this post. I have found the information on a site called ‘enenews.com‘. It collects information from a wide variety of sources, gives brief summaries which are easy to keep up with, and links to the original stories. By the time most of you read this, more will be happening. I urge you to keep up with the news yourself–it’s out there, but it’s not going to come to your TV screen via cable! To summarize, the situation at Fukushima continues to be very bad. I believe the reason we are no longer hearing news about it is not that the situation has improved, but that the news is actually pretty grim. It is a disaster unfolding in slow motion. As far as I understand, the EPA has suspended all monitoring of radiation fallout over the U.S. from Fukushima. Additionally, the Norwegian Institute for Air Research (NILU) is no longer providing forecasts to the public. This gives the illusion of ‘no news is good news’–however, it amounts to a blackout of information to the American people. Fortunately, EneNews is still providing news out of Japan regarding the reactors, and Arnie Gunderson of Fairewinds Associates is continuing to follow the situation. There are most likely news sources out of Europe or Russia too. Unit #1 is in a state of meltdown and is leaking radioactive cooling water. It is possible that the melted fuel (‘lava’) will burn through the bottom of the reactor and fall into the water below. Unit #2 continues to leak radioactive water into offsite trenches. Unit #3 previously had a serious explosion that ejected nuclear fuel 2 kilometers from the reactor. The explosion did serious damage within the reactor. A hydrogen explosion is still possible. It is also leaking radioactive water. Unit #4 is tilting at the top. This is the building where they were storing a large number of spent fuel rods. Groundwater contamination continues; ongoing ocean contamination is probable; air contamination continues unabated, with a number of different types of radioactive particles wafting over the Pacific Ocean, North America, and beyond. In addition, a 60 year old plant worker died, on the job, for no apparent reason. This is all bad news, but apparently no one wants to alarm the public. Now, two months after the quake, 35 of Japan’s commercial reactors have been shut down for various reasons. This represents 2/3 of their reactors. Surely it is causing power shortages and having economic repercussions. However, the March megaquake and tsunami have washed away any illusions that ‘it can’t happen here’, and the Japanese are not taking any more chances. What will it take to wake up people in America? Or will our government and media make sure that we remain blissfully unaware, so that they can continue to pursue their own agenda? This isn’t news I want to post. or believe. Summer is my favorite time of year, and I’d love to spend every moment of it outdoors. However, thanks to the persistence of Nathan Leal (4-5-11 broadcast here), I’ve decided to at least consider the fact that we may currently be receiving radioactive fallout over the entire United States. What’s worse, this radioactive fallout may continue to drop over the U.S. for months. I recently took the time to watch a documentary on the Chernobyl nuclear disaster. (I couldn’t find the same YouTube channel where I watched it, but this is the same video. It’s 1.5 hours long and is called ‘The Battle for Chernobyl’) It is good ‘background’ for understanding the challenges we may be facing. The thing to note now, is that the Fukushima nuclear plant has ten times the radioactive fuel that Chernobyl had, so its potential effect is much greater. I’ve heard it said that simply ‘pouring concrete over’ the Fukushima plant (as they ended up doing at Chernobyl) is not as easy as one might imagine. From watching the Chernobyl documentary, it became apparent that such an endeavor was both very risky and very complex. Add to that, I have heard that Japan has no cement mixers and lacks the raw materials for making cement, and that such things would have to be imported before any such construction could begin. There is plenty of info out there, about what supplements you can take, etc. I’m not going to get into that. You can seek out the information and pray as to what God would have you do for yourself and your family. What I am going to do–hopefully–is help you learn how to ‘visualize’ the radiation that may be falling into your environment. Once you are aware of it, you can decide what you will do to minimize your exposure. I will use Iodine 131 to explain. In many ways, Iodine 131 is the least harmful of the radioactive elements that may reach us from Fukushima. It is not the only radioactive element that may impact us though. But, for the sake of simplicity, I will just talk about this one. The length of time for the radioactivity to drop to a ‘safe’ level depends on how much radioactivity you begin with. Someone in your family is going to have to do the math. So, for simplicity’s sake, lets say there was one event that released radiation and you received fallout one time. You did the math and determined that, for it to be ‘safe’, you needed the radiation to be reduced to 25% of what it was on the day your received the fallout. In that case, you would need to avoid the radiation for 16 days. You will not want to get the rain on you, or drink it (that goes for Fido too). If you get it on you, it would be best to take off your clothes before coming inside–and leave them outside. Come inside and shower and shampoo. Now you are safe inside your home–pretty much. If you can stay inside for the next 16 days–great, not much to worry about! That includes not having anything from outside coming in during that time–no pets or visitors tracking in, no rain leaks, and no fresh breezes. Now, curl up with a warm drink and look out the window. Lets remember when it was raining and bringing down the radioactive fallout . . .
Here’s what happens outside: Every where the rain falls is becoming covered with radioactive fallout. Wherever puddles form, the radioactivity is higher. If you collect rain in a rainbarrel, it will become a big radioactivity emitter until the radiation inside it has died down (decayed). Notice that almost everything gets wet in the rain . . . every table, every chair, every wire, every leaf, every bird, every window, every inch of your roof, etc. Now, imagine that everything that is wet is glowing orange. Even after it dries, it continues to glow orange . . . because ‘drying’ just means that the water has evaporated, but the radioactive dust remains. Imagine everything that was wet as if it is now covered with a glowing orange dust. All this radioactive dust, that is so easily blown around, is why you do not want Fido to go out, if it can be avoided. If he must, imagine him afterwards, covered in orange, glowing dust (fur, feet, inside lungs now, etc.) . Meet him outside the door and clean him up as best you can, then take him to the tub and rinse him down. While in the bathroom, put your clothes in a trash bag. Take the bag of clothes, and Fido’s wet towel to the door, wiping the imaginary glowing orange dust off the floor behind you as you go. Put the towel and the bag of clothes outside the door and plan to leave them there until ‘safe’ day. (You’ll be doing lots of laundry that day!) Go back in and take a shower. After all this trouble, you may decide to give Fido just one meal a day for awhile! Back to looking out the window . . . Notice again, that the orange glowing dust is everywhere. Even when you are in the house, some of that glowing orange dust is not far away from you–because the radioactivity simply goes through walls, roof, windows, etc. Not much is actually on the walls or windows–but if you have a big tree close to the house, notice that every single leaf is glowing orange and sending radioactivity towards you. The ground is also glowing orange and sending up radioactivity. The roof is glowing orange as radioactivity shines down on you from above. And if water typically runs into your basement, orange radioactivity is shining up on you from there too. So, this is how you live until ‘safe day’ . . . which is great, if there is only one ‘event’ and you receive fallout only once . . . But lets say the threat is ongoing, and you receive another rainstorm on day 10 . . . all of a sudden things get really complicated. Now, the previous, partly decayed (no longer 100%) radioactive dust is washed off surfaces by the rain (new, contaminated rain). Imagine it glowing radioactive red. The old dust isn’t gone, it’s just mixed in with the rain, and ends up on the ground, making it the most radioactive surface–imagine it glowing and swirling red and orange. Everything else is glowing red and tomorrow will be a radioactive red dust that will begin its process of decay. The ground (and your rain barrel) now have the highest radioactivity. Time to find out how much fallout you were exposed to this time and ‘reset’ the clock for how long you’ll need to stay inside before it’s ‘safe’. Now the math is getting complicated, because you have to keep track of the old fallout and the new fallout. And, every time it rains, it gets harder to figure out. This is just one scenario. It may not be that bad. It may be that you are only getting trace amounts each time–but if you don’t know how much, and you aren’t doing the math: how do you know when you’ve had too much and need to stay inside awhile and take precautions? Is it when it has rained twice? Ten times? Twenty times? Or is it when you’ve gotten two inches of rain? Six inches? Sixteen? It is virtually impossible to know if you are not getting accurate information about what you are being exposed to and how much. Lets say though, for the sake of argument, that by the grace of God we DO only get trace amounts throughout the summer, that it is only Iodine 131, and that they are able to stop the radiation leakage soon. This is an absolute best case, most optimistic scenario . . . and in my opinion, not likely. But, if we are this fortunate, what do you need to do, to minimize your risk? Rather than open windows, use a/c. Use good filters, and change them often. Leave contaminated things outside the house. Minimize what contamination you track and carry into the house. Shower and shampoo after coming in from outdoors. Wash your pets (very) often. Keep pets in as much as possible. Stay in as much as possible so you aren’t breathing in radioactive dust. Wear a dust mask (over mouth and nose) when outdoors. Don’t collect rainwater unless you know it isn’t contaminated. Wait a month or so to use rainwater you’ve recently collected. Plan to use a lot of tap water this summer–for cleaning the plants often, and for watering them. Rinse the plants (and especially the edible parts) daily, taking care not to splash mud back onto the plants. Consider covering the ground with plastic and planting through holes in the plastic. If you use big staples or rocks to hold down the plastic, you can lift it up when you water (with tap water). This will help to reduce the amount of radioactive water the roots take up. Plant things that don’t need to be eaten right away (like dried beans, dried corn, etc.). Plan to can your produce and wait a few months to eat it. Skip the greens, for now. If you really want to eat vegetables fresh from the garden, grow something that can be washed and peeled. Be sure to rinse the plants daily while they’re growing, and wash and peel before eating. My guess is that root vegetables (carrots, turnips, potatoes, radishes, etc.) are probably not a good choice. But, if you insist–cover the ground with plastic (as mentioned above) and be sure to wash the leaves of the plants daily, because plants do absorb things through their leaves. Realize that you are increasing your risk by being outside. Wear a dust mask. Wear a hat. Clean yourself up as much as possible before going inside. Leave your clothes at the door. Don’t track into the house. Shower and shampoo. Remember, like I said–this is a BEST case scenario and these suggestions are just a starting point, because things may not go this well at all. You saw that for Iodine 131 (whose half-life is 8 days) to decay to 3% takes about 6 weeks. The other possible radioactive contaminants have half-lives of many years–that means many years to be reduced from 100% just to 50%. Most of the precautions listed above are not going to be anywhere near sufficient if we receive fallout of anything other than Iodine 131–or if we receive more than trace amounts of it (Iodine 131). For now, not much is being said. For now, most people prefer to believe everything is ok (and those who may potentially have legal liability prefer it that way too). But that doesn’t mean nothing is happening! That is precisely how the Chernobyl event was handled (and the BP spill . . .?). For a nation that is prone to denial, an invisible, unreported danger is the easiest of all to ignore!